The Donor Site was a residential development known as Dolau Court in Llanelli, South Wales. The Receptor Site was a derelict parcel of land in close proximity to the Donor Site with a requirement for fill material to raise levels in readiness for a subsequent development. Both the Dolau Court Site and the proposed development are being managed by Gwalia henceforth the remediation and reuse of treated material was regarded as a ‘Cluster Project’. The residential development was built in the early 1990’s on a brownfield site. The area formed part of the former dock area of Llanelli which has now been infilled and reclaimed. The development was built on land which was raised and leveled prior to development by the importation of contaminated fill material. The site was previously occupied by a former saw mill and a timber yard (which were potential sources of contamination). Gwalia commissioned Earth Science Partnership [ESP] to undertake a thorough site investigation to assess the nature and degree of contamination on the Dolau Court Site and to identify the potential risks to the residents through the presence of contamination in accessible garden and landscaping areas. ESP identified the presence of Arsenic, Lead, Benzo(a)Pyrene [BaP], Polycyclic Aromatic Hydrocarbons [PAH) and Total Petroleum Hydrocarbons (TPH) within the soils contained within garden and landscaping areas. Statistical analysis showed that the recorded levels of Arsenic, Lead and BaP created the potential for Significant Potential of Significant Harm [SPOSH] to the residents. There was no evidence to suggest that any remediation had been previously carried out to address the historic contamination associated with the site. There were numerous exceedances of guideline values. ESP therefore concluded that remedial action was necessary to address the identified SPOSH concerns. The proposed remedial action comprised the removal of the 600mm upper soil horizon from front and rear garden and landscaping areas followed by subsequent reinstatement with an underlying geotextile layer and clean soils to return the garden / landscaping areas to previous levels. The shared landscaping areas were also capped. Excavated soils were transfer to the Treatment Area where they were treated ex-situ. A total volume of 3,789m3 of soils were treated over a 19 week period. Following a suitable period of “curing” representative samples of treated soils were leach tested and compared with the Environmental Quality Standards leachate target criteria for the identified contaminants of concern. In total 30 composite samples were tested to demonstrate compliance of the treated material with the preagreed remediation criteria for the Receptor Site. The validated and treated [recovered] material was deposited at the Receptor Site. 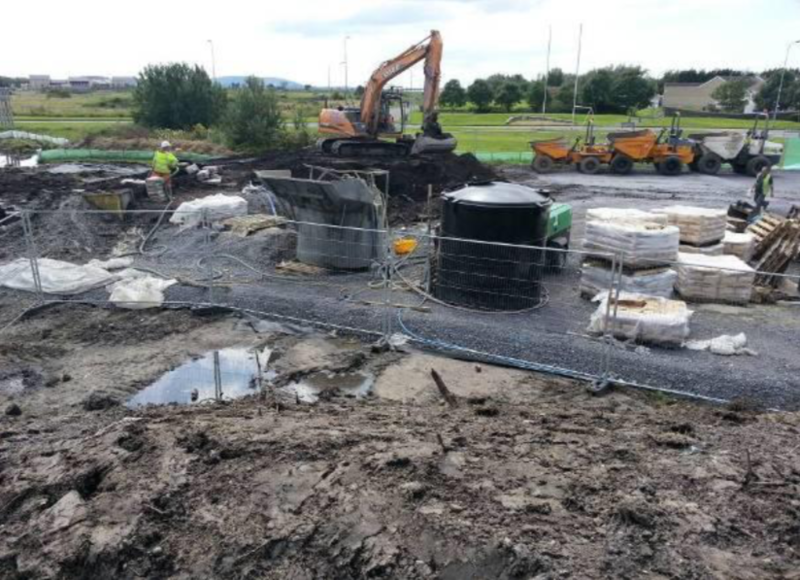 The remediation works undertaken by Envirotreat represented a significant cost saving to the client in terms of saving costly hazardous waste disposal associated with the donor site and and import costs associated with the receiver site.